Cover design for a set of two 8 disc boxes that collect the 16 full feature films directed by the Coen Brothers. It's a shame how most of the DVDs and Blu-ray discs released nowadays are presented in cheap plastic cases with huge holes, no booklets and many times horrible cover art. 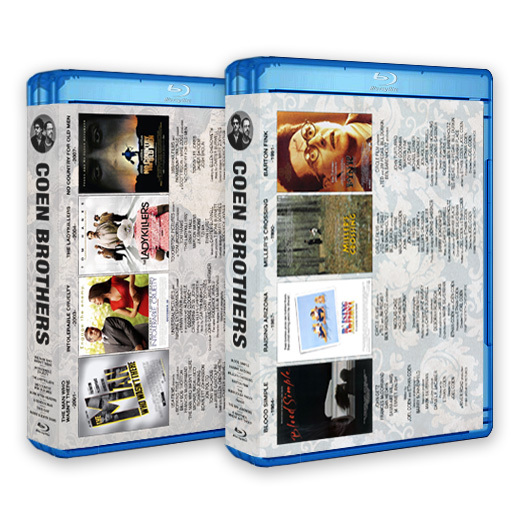 We already owned many of the Coen brothers movies on blu-ray so I thought it would be great to complete their filmography in a more convenient way. I choose the affordable Viva Elite 8 disc boxes to fit the 16 films the Coens have directed till the day. I organize them chronologically and for the cover art I used the original movie posters and rewrote the credits included in therein, so they could be readable. The two boxes together measure just the same as four single disc boxes so shelve space is not wasted and as original movies carry no special cover art or booklet, there is nothing to miss.